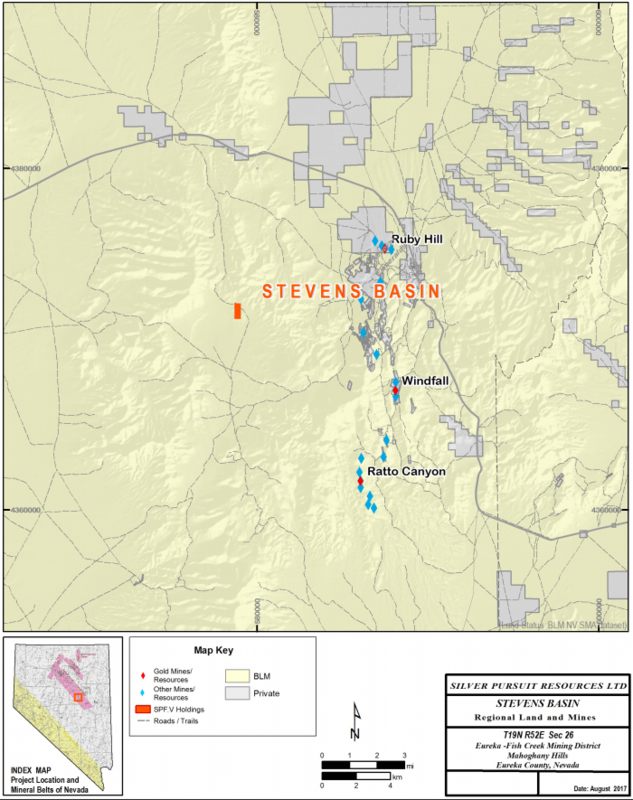 The Stevens Basin Project is located approximately eight miles west of Eureka, atop the Mahogany Hills. 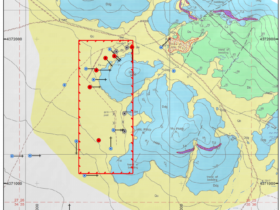 The elevations range from 7203 to 7828 feet (2195-2386 m) in the project area. Carlin-type, disseminated gold, hosted in favorable structural and lithologic horizons within the Devonian carbonate rocks. 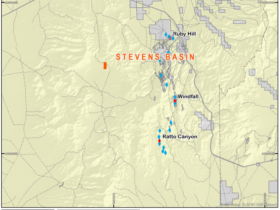 Several old drill sites have been identified at the project and are thought to have been completed by Teck Resources, in the 1980’s. Results of this work are unknown. 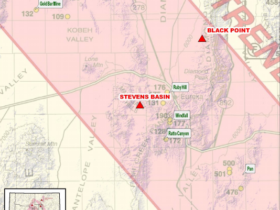 In 2010, Columbus Gold Corporation completed a rock chip sampling program including 237 samples, then leased the property to Navaho Gold (Australian) in 2012. Navaho completed several geophysical surveys and eventually completed 22 RC drill holes at the project with a total of 12110 feet (3692m). 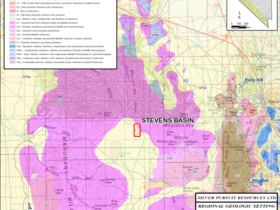 Six holes intersected gold at greater than 0.10 g/t. 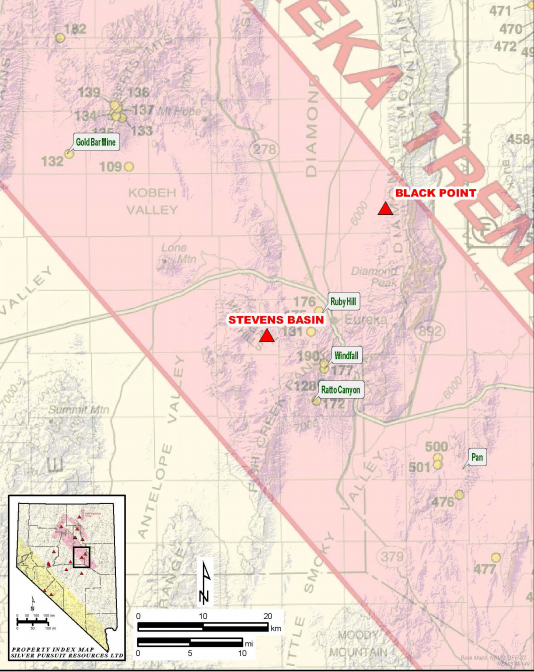 A vertical hole SB11-09 had anomalous gold over 105 feet that includes 50 feet of 0.18 g/t. 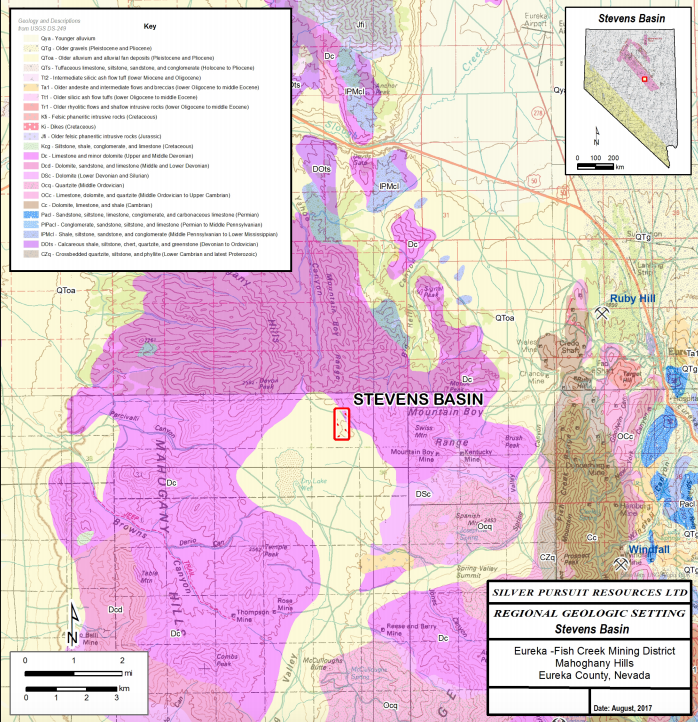 The high value in all drilling is 0.52 g/t gold. Better gold values tend to be associated with As and Sb, typical of a Carlin-type gold system. 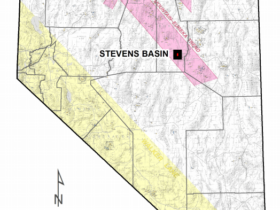 The geology at Stevens Basin is made up of Devonian-age carbonate rocks that include the Simonson Dolomite and the lower Devils Gate Formation and. These units are intruded by Tertiary (Jurassic?) felsic sills and dikes. Small jasperoid bodies are present along structural zones developed in the carbonate rocks. The jasperoids locally carry gold mineralization. The Simonson Dolomite forms blocky, step-like topography with light and dark banded dolomite in the northern Mahogany Hills. Locally, the Simonson exhibits fine laminations, soft sediment deformation, tight folds and breccias. 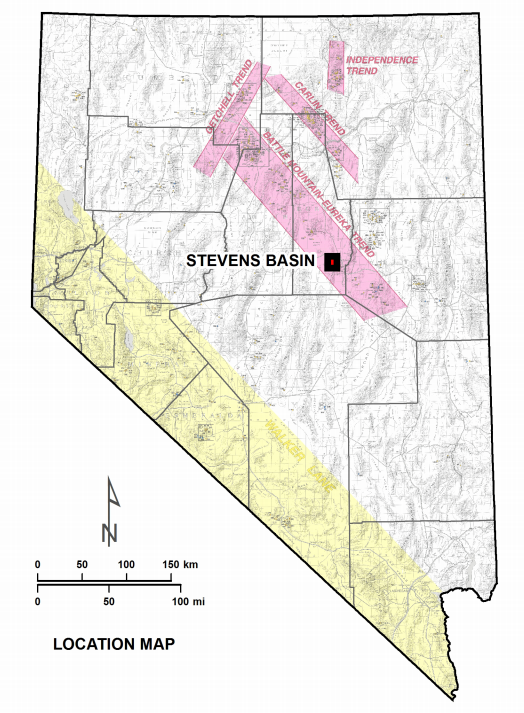 The Devils Gate Formation tends to be resistant cliff-former but regionally includes turbiditic debris flows that may be favorable for disseminated mineralization. Felsite sills and dikes, of undetermined age usually less than 10 meters (33 feet) in thickness occur in places. They are fine grained, cream to tan granitic rocks. Compositionally, the rocks are similar to stocks in the region. The intrusive rocks outcrop poorly and in many cases are evident only as concentrated float in recessive topographic areas. The rocks are porphyritic and exhibit select near-pervasive clay alteration of the feldspars. 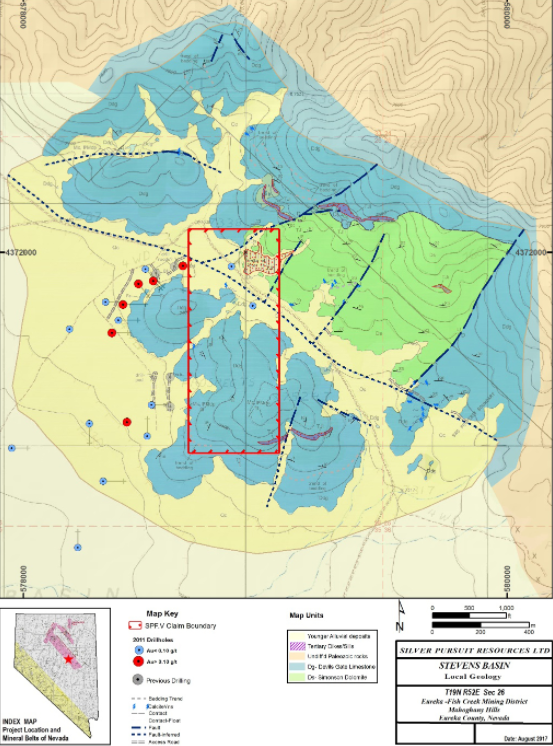 The data from work completed by Columbus Gold and Navaho is being reviewed to develop an exploration program to offset better holes along the most favorable trends. 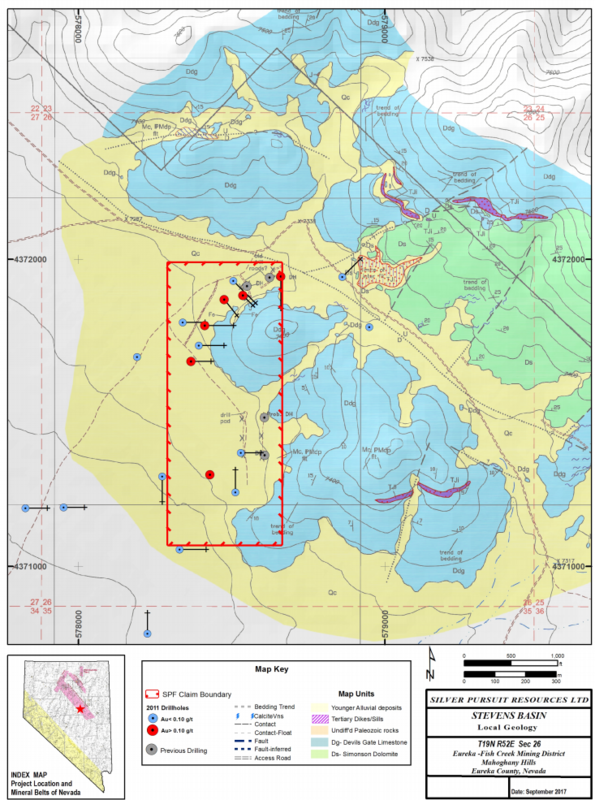 The results of the geochemical sampling and geophysical surveys are also being reviewed to determine if other favorable targets are indicated. 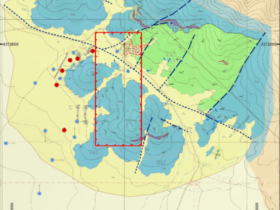 Other surface sampling should be conducted around the edges of anomalous grid sampling previously completed.